“Knightfall” begins in the Fairy Tale Realm with Alice, a growing young girl, and Alt-Killian. Alice is still trapped in her tower, thanks to Mother Gothel… also her actual mother. Alice has recently started having nightmares that Gothel returns to the tower and kills her father. Alice is highly distraught, despite Alt-Killian’s attempts to reassure her. Alt-Killian is determined to free his daughter from the tower, once and for all. Before Alt-Killian leaves, he gives Alice a white knight chess piece to remember him by and promises to return soon. Alice gives him a black rook to remember her. Alt-Killian sets out to find Rumple, who is locked away in a dungeon in a cave. He’s willing to set aside his demand for revenge for help for magic to set Alice free. Alt-Killian promises to free Rumple from the prison. Rumple tells of a magic weapon to shatter any prison, now held by Captain Ahab–Maui’s fish hook. OHITHERE MOANA!!! Alt-Killian finds Ahab at a tavern (Mr. Smee and the old group are there, too.) Ahab challenges Alt-Killian to a fight, which Alt-Killian denies. Instead, they’ll play a game of dice. If Alt-Killian wins, he gets the fish hook and if Ahab wins, he gets the Jolly Roger. With Alice’s rook for luck, Alt-Killian wins! Ahab is bitter and accuses Alt-Killian of going soft. In his pride, Alt-Killian says he plans to use the hook to kill the Dark One. He returns to Rumple with Maui’s fish hook and demands to know how to break Alice out of the tower. 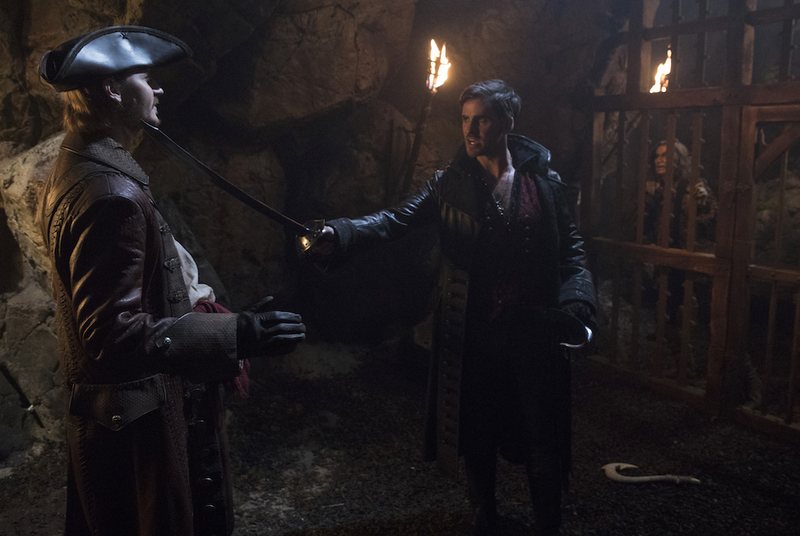 But Ahab has followed Alt-Killian and accuses him of helping the Dark One escape, not killing him. Captain Hook really has gone soft. Ahab taunts Alt-Killian and mentions Alice. He challenges Alt-Killian to a public duel. Rumple warns Alt-Killian to focus on freeing Alice, even if that means helping him. But Alt-Killian agrees to the duel. The next day at the duel, Alt-Killian and Ahab draw pistols, walk ten paces, and fire. Alt-Killian’s memories of Alice flash in his mind. But while Alt-Killian is nicked in the arm, Ahab was hit in the gut. Alt-Killian reaches for Alice’s rook and realizes this duel was a huge mistake. Alt-Killian returns to the tower with Maui’s fish hook, but when Alice tries to hug her father, they’re blasted apart. Mother Gothel has arrived and his heart has been poisoned against Alice (with the bullet from the duel!). Gothel disappears with the fish hook and Alt-Killian is left outside the tower, listening to Alice call for him. In Hyperion Heights Detective Rogers is trying to investigate who attacked the Blind Baker woman. He’s interrupted by Tilly, who wants to play a chess game. She insists that playing a game would be helpful, especially since she has a feeling today is going to be a bad day. Something awful is going to happen… Rogers sends Tilly home and Weaver arrives with news that the Blind Baker is at the hospital being treated and there are police posted outside the door in case the killer returns. The next step is to track down Eloise Gardner and figure out who else is in the cult and needs protection. Interesting that Eloise shows up to talk in the very moment… In the interrogation room, Weaver asks for information about the coven and Victoria’s death. But Eloise demands to speak to Rogers alone. Rogers has a plan to let Eloise think she’s in control of the conversation; then he’ll rope her in. Eloise flirts a little, but eventually admits she also wants to prevent women like her from being killed. She directs him to one of the doodles he’s drawn of a ship… the Jolly Roger. “If you want to learn the truth about the filler, first, you need to learn the truth about yourself.” Why does she want Rogers to wake up to his Fairy Tale self? Eloise asks Rogers to bring her one of his paintings. Rogers is willing to play this game, even though Weaver is very skeptical. Weaver goes back to the precinct and sees Tilly there, who is very distraught that Eloise is there. Rogers returns with the painting and Tilly becomes even more agitated. She just knows that “the monster” will use the painting to hurt Rogers. This time, both Rogers and Weaver tell Tilly to go home. Before she leaves, she looks at the TV screen broadcasting the interrogation room and Eloise waves at her. Rogers shows Eloise his first painting, of a ship. She asks him what it really means to him. Rogers talks about loving the ocean as a child and never being able to get to it. He reveals his pain about being alone and not having anyone to share his life with. Eloise says that the killer also has a pain… and that before they were attacked, the killer gave the doctor and baker a heart-shaped box of candy truffles. If Rogers wants to find the killer, he must follow his heart. Rogers and Weaver arrive at a local gift shop and see a heart-shaped box of truffles as delivered to the proprietor’s wife. However, the wife has been dead for years. Weaver believes this was all a set-up by Eloise. It’s a distraction… and when they return to the hospital, they see the Blind Baker has been killed. Tilly is there holding the scalpel that was used as the weapon. She warned Rogers something bad would happen today. Tilly jumps out of the window to escape. When Rogers and Weaver get to her home, they find evidence that she might be the killer. The insignia of the coven is there. Neither believe Tilly is the killer and they need time to prove her innocence. Elsewhere, Roni/Regina meets Henry as she’s doing a little walk of shame… she’s coming from Dr. Facilier’s place, “catching up with an old boyfriend”. Henry shares that last night while at Jacinda’s place, Lucy broke them up and started acting like he is no longer good enough for her mom. This catches Regina’s attention. Lucy is devastated that she can’t get her mom and Henry together. But to save her father, she knows she must plant the seeds to dissuade her mom from getting closer to Henry. 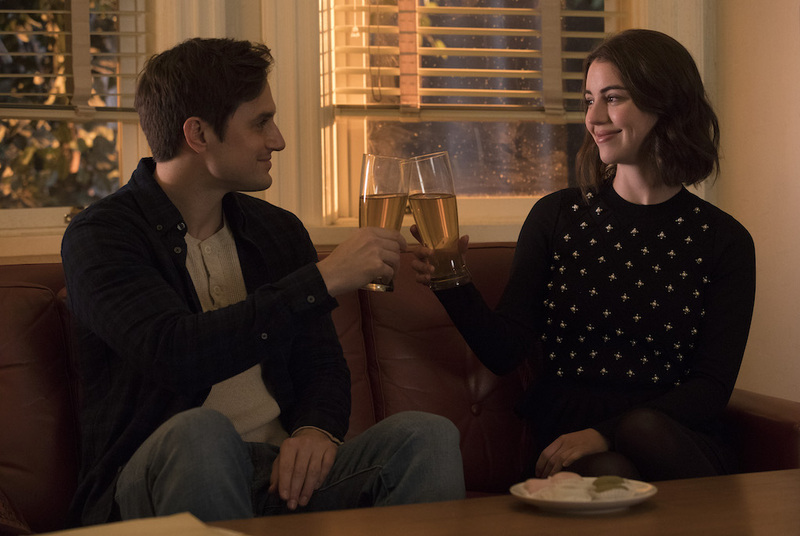 Henry visits Ivy as she’s cleaning up Victoria’s things. She’s lonely and confused that her mother did actually love her in the end. Ivy kisses Henry, but he backs off. In her grief, Henry says Ivy should turn to her family, instead. Ivy still has a chance to make things right with Jacinda and Lucy. Lucy brings Jacinda a box of stuff that was at Victoria’s place. Jacinda shares how she things there’s only something off with Lucy… Ivy reassures her that she is a good mother. Jacinda realizes that Ivy did want to talk and gives her a hug. Jacinda also gives Ivy her old doll, Beatrice. This also sparks something in Ivy, that to make things good with her mother’s memory, she has to finish what Victoria started. The episode ends with Lucy coming to see Roni with the page about Henry dying if magic returns. Roni reveals that she knows she’s Regina Mills and promises to help her granddaughter, Lucy Mills! Operation Hyacinth is underway! Once Upon a Time airs Fridays at 8p/7c on ABC.